The Viktoriapark in Berlin’s Kreuzberg district is quite a special sightseeing opportunity – for a number of different reasons. First of all: it’s an old park – and it’s a nice park indeed. And, I may have said this before, but it’s a very old park. The Viktoriapark first opened in 1894. 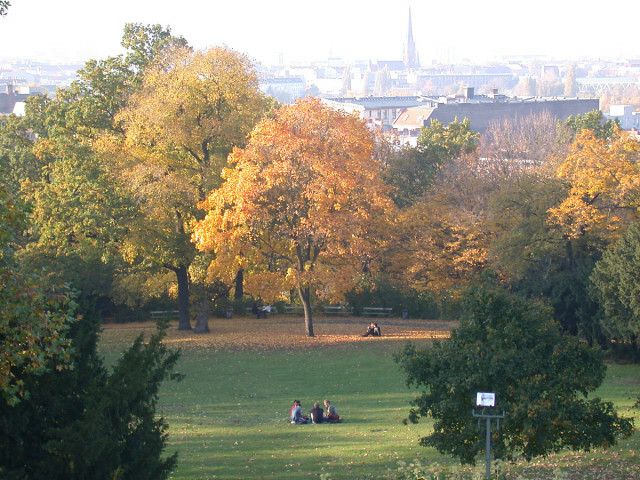 And the hill, the Viktoriapark is built on, has given the neighborhood its name: Kreuzberg. 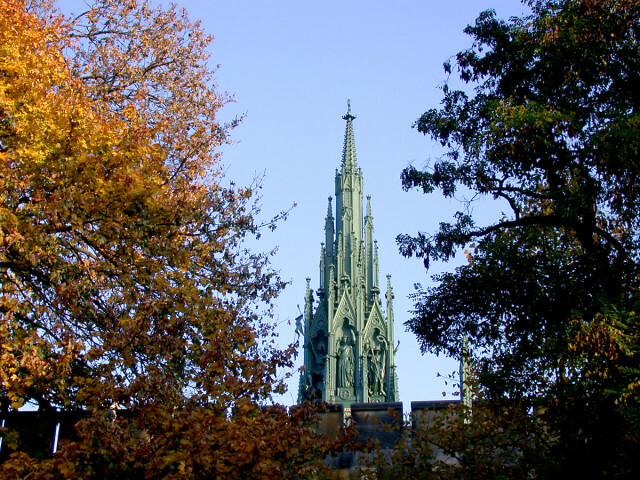 Let’s begin with a brief look into Kreuzberg’s history. Before 1821 the hill was known under the names Tempelhofer Berg (Tempelhof Hill) or Runder Berg (Round Hill). In 1821 the monument, that you can still today find on top of the hill, was inaugurated – and the hill was then renamed after the cross that can be found on top of the monument. The monument itself was designed by architect Karl Friedrich Schinkel, who was back then one of the most active architects of Berlin. Large parts of Berlin’s city scape are shaped after Schinkel’s original designs. Even though Viktoriapark is a rather small park, it has quite a lot to offer. Approaching the park from the north / from Großbeerenstraße you may have noticed a waterfall and Ernst Herter’s bronze sculpture Der seltene Fang (“The Rare Haul” / “The Rare Catch”). Actually all of the north side of Viktoriapark is designed following the idea of a mountainous landscape: steep hillsides, water, a creek, the waterfall, a lake – the Wolfsschlucht (“The Wolf’s Gully”). From platform at the top of the hill (66m) you can look down the north side. Following the waterfall you can look down Großbeerenstraße basically all the way to Mitte. To the east the Viktoriapark has some nice green sunbathing lawn. For over 30 years the beer garden Golgatha is a popular hang out. during the summer season. During the winter months you may see people having a jolly good time sledging down this more shallow hillside.